The Animas River during the height of the Gold King Mine spill (photo courtesy of La Plata County). A little over two weeks after the U.S. Environmental Protection Agency and contract workers accidentally released 3 million gallons of acid mine waste into the Animas River, lawmakers are gearing up for a deluge of debate over how best to solve the problem of thousands of abandoned mines leaching into watersheds all over the West. Experts on mine waste cleanup efforts expect renewed interest in U.S. Rep. Raul Grijalva’s Hardrock Mining Reform and Reclamation Act of 2015, which the Arizona Democrat introduced in January and has been languishing in committee since February. 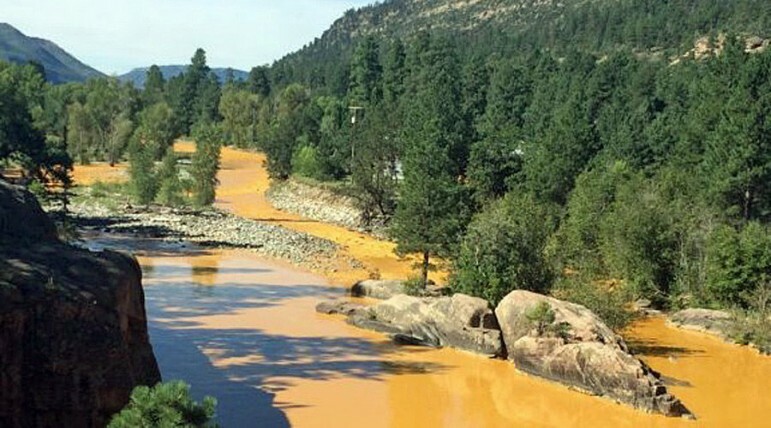 Grijalva’s bill, which is cosponsored by 25 other Democrats, including Colorado Reps. Jared Polis and Diana DeGette, would require royalties for hardrock mining operations on public lands, create a fund for cleanup of abandoned mines such as the Gold King Mine near Silverton and includes a Good Samaritan provision to absolve third parties of liability for cleanups. Colorado’s Republican lawmakers are focused on Good Samaritan legislation separate from Democratic efforts to reform the 1872 Mining Act, which – unlike coal, oil and gas mining – does not require companies to pay royalties for extracting hardrock minerals such as gold from federal lands. “We have known for a long time that mining regulations are absurdly outdated and leave many problems for local communities long after mining operations stop,” DeGette said in an email statement to The Colorado Statesman. But Republican Rep. Scott Tipton, whose Western Slope district includes the area of the spill, wants to see Good Samaritan legislation only. He sponsored an unsuccessful House version of a bill in the last Congress that former Sen. Mark Udall, a Democrat, introduced in the Senate. Tipton spokesman Josh Green said Grijalva’s bill has little chance of passing in the current Republican-controlled Congress, which reconvenes after Labor Day. Good Samaritan legislation would give third-party groups such as state and local governments, nonprofit groups and mining companies binding legal safeguards to remediate abandoned mine sites, many of which date back to the late 19th century. Udall tried for years to pass Good Samaritan legislation and reform the 1872 Mining Act, meeting resistance from his own party in the form of former Senate Majority Leader Harry Reid, whose home state of Nevada is one of the most mined in the nation. Udall’s successor in the Senate, Republican Cory Gardner, says he’ll take up the issue after the break. New Mexican Democratic Sen, Martin Heinrich told the Albuquerque Journal last week that he’ll introduce 1872 Mining Act reform in the Senate this fall. Colorado’s Democratic senator, Michael Bennet, told The Statesman he’s supported reform efforts in the past and is likely to do so again this session. “Right now, we’re still tackling the immediate health and environmental effects of this spill and investigating the actions that led to the spill,” Bennet said. “But it’s time to start thinking about the bigger picture and the serious issue of legacy mine contamination in the West. Good Samaritan legislation by itself won’t solve the problem, says Lauren Pagel, policy director of the environmental group Earthworks. “You could have all the good Samaritans in the world, but if there’s not enough money to clean up these sites, then they’re not going to get cleaned up,” said Pagel, whose group backs Grijalva’s reform bill, which would require 8 percent royalties for new hardrock mines and 4 percent royalties for existing mines. Stuart Sanderson, president of the Colorado Mining Association trade group, says it’s unfair to charge modern mining companies royalties to fund the cleanup of mines abandoned by other companies that did business in a bygone era when reclamation standards were virtually nonexistent. But he says the industry would support Good Samaritan legislation. “One of the greatest impediments to the cleanup of these old sites is the absence of any kind of legislation authorizing for Good Samaritan site remediation,” said Sanderson, who wants the modern industry absolved of liability so it can clean up old mines. Sanderson blames the EPA for the Gold King fiasco and wants industry experts more involved in cleanup efforts, adding environmental groups are using the situation to revisit mining reform.